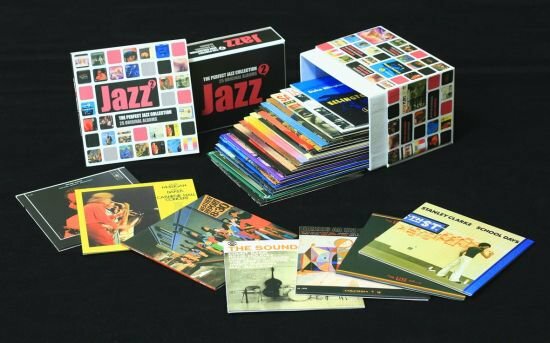 Import 25 CD boxset containing 25 of the finest Jazz albums ever released. Each album is packaged in a card wallet, and the box set includes a 40 page booklet in both English and French. The collection contains the following albums: Duke Ellington - Ellington Uptown; Dave Brubeck - Jazz Goes To College; Louis Armstrong - Satch Plays Fats; Miles Davis - Round About Midnight; Various Artists - The Sound Of Jazz; Charles Mingus - Mingus Ah Um; Sonny Rollins - The Bridge; Paul Desmond - Desmond Blue; Thelonious Monk - Underground; Freddie Hubbard - Straight Life; Mahavishnu Orchestra - Birds Of Fire; Clifford Brown - The Beginning And The End; George Benson - Beyond The Blue Horizon; Herbie Hancock - Thrust; Wayne Shorter - Native Dancer; Gerry Mulligan & Chet Baker - Carnegie Hall; Chet Baker - She Was Too Good To Me; Jim Hall - Concierto; Stanley Clarke - School Days; Return To Forever - Romantic Warrior; Weather Report - 08:30; John McLaughlan, Al Di Meola, & Paco De Lucia - Friday Night In San Francisco; Dexter Gordon - Round Midnight; Carmen McRae - Carmen Sings Monk; Wynton Marsalis - Standard Times Vol.3. Sony.